How to make text copy in PDF previewers ignore lineno line numbers? I'm using lineno for a document. I have it configured to put line numbers in the margins of the document. I generate PDF using pdflatex. Here's the problem: when people copy a region of text in a PDF previewer (Acrobat, or Mac OS X's Preview), the line numbers are included in the text that's copied. This leads to confusing text when they paste it into another document or application. Is there a way to make it so that the line numbers are ignored when someone copies text from within a PDF previewer? I would like just the main text to be copied, not the line numbers. Using a method similar to that proposed in How to make listings code correct copyable from PDF and with hyperlink, the following works (at least in Adobe Reader). Not the answer you're looking for? Browse other questions tagged pdftex pdf viewers line-numbering copy-paste or ask your own question. Is there a LaTeX trick to prevent a PDF viewer from copying the line number? How to make listings code indentation remain unchanged when copied from PDF? What can cause generated PDF document whose text are not correctly copyable? How can I preclude copying & pasting of listings? Embed all fonts by “exporting as PDF”, but cannot copy text any more? 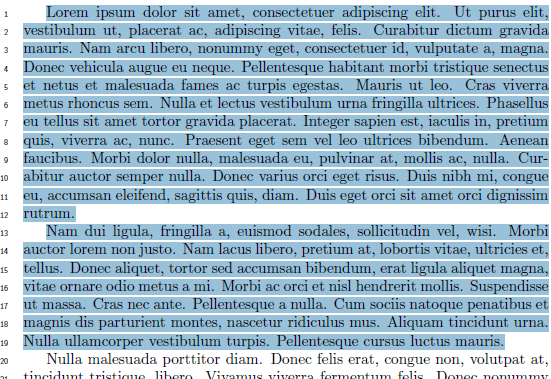 How does one make \textls text copy-and-pasteable in PDF?